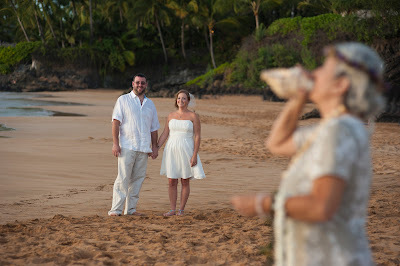 Beach weddings on Maui offer a unique opportunity for couples who want to be out in nature, in beautiful surroundings. Bare toes in the sand, the ocean a mere few feet away and the breeze caressing your face are all good reasons to do the ceremony on the beach. Plus, it's free! 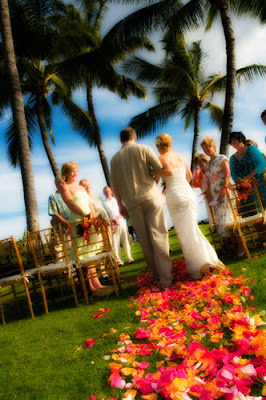 There are times however where a private or semi private Maui wedding venue is a much better choice for you and your guests. As you may know, the state of Hawaii does not allow us to place chairs, arches, huppas, tiki torches etc. on a public beach. When we have 30 or more people on a beach, they are standing all over the place. Often they wander behind the bride and groom to get some pictures which can interfere with your photographers' ability to get the shots you are paying her for. Without clear boundaries, guests may move in to occupy the spot the photographer was using a moment ago thus preventing him from going back to that prime spot. If there's a videographer on the scene, this will add to the chaos. A large group will be spread out pretty far. In an uncontained environment this will always lead to people moving about, which can be distracting to the couple. Your guests will be behind or to the side of the minister who will have to speak quite loudly in order to overcome your guest's placement, the wind and the sound of the waves. For a small intimate grouping, this is not a problem but for a large group of 30, it can and often does lead to a great deal of discomfort on the part of the bride and groom. As a Maui wedding photographer myself, I have overheard many guests at these overly large beach weddings complain that they can't hear a word the minister is saying, and isn't that the whole point of the wedding in the first place? We have found that for a reasonable fee, a semi private venue solves all of these issues . 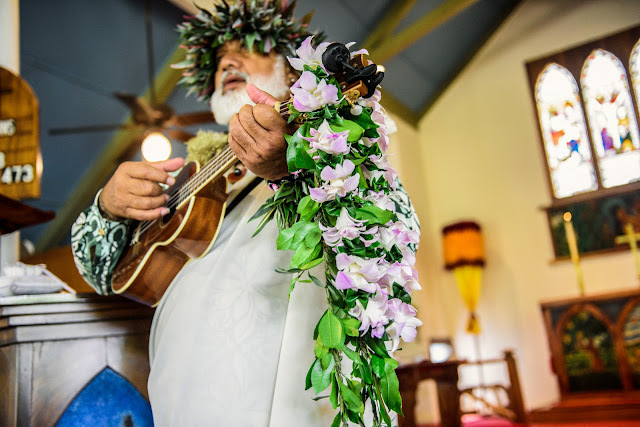 We can place chairs for guests, erect arches, there's plenty of parking and the musicians can plug in their battery operated amplifiers so the guests can hear the soundtrack to your beautiful Maui wedding. 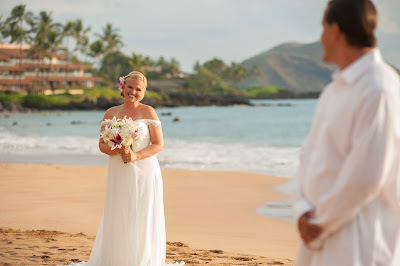 In addition, we can usually take the bride and groom down to the beach after the ceremony for a 20 minute portrait session in the sand with a magnificent Maui sunset as the backdrop. All this while keeping the guests in their chairs which reduces the noise and chaos, stays out of the way of your professional photographer and videographer and allows the minister to be heard. Don't get us wrong, we LOVE beach weddings and we do them all the time. Our number one priority is the satisfaction of our clients on this once in a lifetime day and in order to accomplish that, sometimes a semi private or private venue is the best way to achieve that goal.